It's not just a night reserved for ghosts and goblins anymore. Now that you're a parent, Halloween has taken on new meaning: a chance to dress up your little one, take tons of darling photos and nibble on some sweet treats with your little pumpkin. But before you get carried away by the spirit of the season, take a few minutes to consider what you can—and can't—do with a young baby or toddler to ensure a safe, happy Halloween for you and your family. High up on the list of favorite first moments is your baby's first Halloween costume. (Sure, he may not know the difference between his PJs and a pumpkin get-up, but you'll get a kick out of it.) As you sift through the myriad of options out there, consider what's trending with infant/toddler costumes this year. According to a spokesperson for Party City, superheroes like Captain America are big for little boys this Halloween, while princesses like Snow White and Arielle continue to reign supreme for baby girls. The classic Halloween candy corn ensemble is a perennial favorite for both boys and girls. "Disney Baby is a popular choice this year," says Amanda Marples, senior marketing specialist for Disguise, makers of Halloween costumes. "With fun bodysuit and tutu styles, babies can be made up to look just like their older siblings." Minnie and Mickey Mouse are top picks for babies and toddlers, not to mention their moms and dads dressing up. "Adults love it because it creates a look for the whole family," she adds. Animal-themed costumes round out the list of hot Halloween ideas, as evidenced by celebrity baby trend expert Rachel Florio-Urso who recently purchased a plush lamb costume for her young daughter. "Whatever you decide on purchasing or creating should be appropriate and comfortable," she says. "At the end of the day, it's all about having fun and being seen in something that makes you feel happy." To Trick or Treat or Not? Now that you've chosen a great costume for your little guy, it's time to grab a treats bag and hit the streets…or is it? While you may be keen on showing off your costumed cutie to all your neighbors, be realistic about what type of festivities you choose for your temperamental tot. 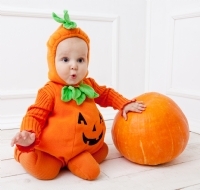 "If you've got a baby, Halloween is more about the photo opp than the trick-or-treating," notes Jessica Hartshorn, senior lifestyle editor for Parents and American Baby magazines. "Dress up your baby early in the day, when she's in a good mood, and share a sweet picture. Later you may have her watch a Halloween parade or even join you in her carrier or stroller." But, Hartshorn cautions, don't expect miracles out of your Minnie or Mickey Mouse. "You can't count on a baby under 2 caring for all the Halloween pageantry," she says. "These couple of years is going to be more about you than her!" Of course, no Halloween would be complete with indulging in a sweet treat. But that doesn't mean your sweetie has to surrender to sugar. "If you are avoiding candy all together, then orange fruit cups packed in its own juice are great alternatives to the traditional processed candy," says nutritionist Dr. Keith Kantor. He also suggests such all-natural candy alternatives like Newman's Own Organic snack-size chocolates, Annie's Organic Bunny Fruit Snacks, Cliff Kid Z Bars and Yum Earth Organic Gummy Bears. If you decide to let your toddler sample a small piece of candy, be sure to stay away from hard candy and chewy taffy, which can pose choking hazards. "A taste of a mini chocolate bar isn't going to hurt your toddler, so I say let them try a chocolately treat," says Hartshorn. "There's also plenty of yumminess this time of year that has a healthy bent, such as pumpkin seeds and sliced apples. Everything in moderation is always a good rule."